Ocean Craft Marine recently participated in the delivery of new Fire- Fighting RHIB boats and training to the MACL Airport Rescue and Fire Service Authority at their facilities located on Hulhule Island in the North Malè Atoll. 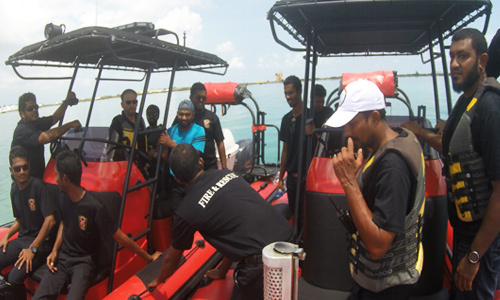 The MACL Airport Rescue and Fire Service received two highly customized, multi-mission, 8.0 Meter Fire-Rescue Boats. These boats were specially designed and equipped for their unique aviation fire/rescue mission to include onboard fire-pumps & fire-monitors, closed-cell foam-filled tube-sets, 20-person self-deploying SOLAS approved life-rafts and each boat equipped with a self-righting system. 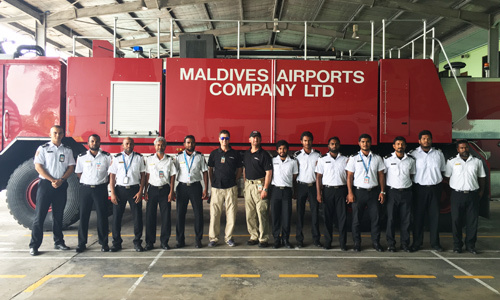 Mr. Salus, OCM Vice President, provided several days of intensive classroom and on- water training to the Maldives Fire Rescue Team. “…MACL Airport Rescue and Fire Service has one of the most challenging Areas of Responsibility (AORs) that I have ever worked in,” said Salus. In addition to the team’s responsibility for the Malè International Airport itself, their on-water headquarters is situated in the very center of three active sea-plane runways which themselves see 450+ sorties a day!” “Given their high operational tempo and unique operational environment, the Maldives’ Fire Rescue Team was one of the most highly motivated and skilled teams that I have had the honor to work with,” Continued Salus. In addition, the Airport Maintenance Crews were also provided detailed training in the maintenance and repair of the boats, outboard motors, and on-board fire-fighting equipment.